well took a break from the bath bombs to catch back up on soaping. Made a batch of sandalwood on thursday night and on saturday I made a new batch of pink sugar. I decided to change up the colors on the pink sugar and I am pleased with how they came out it is a combo of neon pink, as well as white and blue micas. 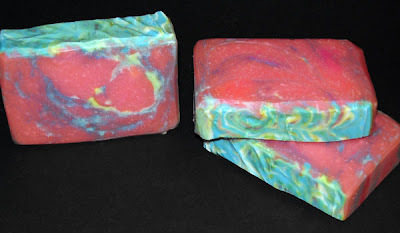 Sandalwood is still by far my best selling scent, it is just a nice clean scent and guys and girls can use it. I have also been working on making new labels and such for all my products, once I get those done and the pictures taken I will have to update my website. It is also tax time(the not fun part of running a business) so the to do list is still really long and like normal I have a million ideas I want to work on with little time to do them. The first testers have started to check in and are very impressed. The first one emailed me and asked how much they were and could she get more, she said she loved it and her sister wants some too. Another tester also loved her black raspberry vanilla bomb and was ready to buy. I told them I am still working on them some more including a test of shipping them across a few states to see how my packing holds up, all the little things before I am ready to add them officially to my line. I did place an order with the main bath bomb maker online who sells to the public and does wholesale to a large number of other crafters. The package arrived a few days ago. After all the rave reviews I was a tad dissappointed in what I got. I picked out 4 different scent I knew I would like. I opened the package and the little carton they were placed in inside the box had broke into pieces luckly only one bomb showed some damage. They did toss in a few samples of other creams they made and those were nice. The bombs were on the smaller side but the way they were made didn't seem that good, most of them didn't really line up most where off center and you could see lines in the middle. The scents were strong and nice but when I dropped the first bomb in the water it barely fizzed and my skin wasn't all that super soft after I was done with my bath. So in all I was dissappointed with the order I got, I did give some of the other bombs to the other testers so they can tell me what they think after trying my bomb and someone elses. After all this testing I do feel I make a good quality product that shouldn't dissappoint anyone. 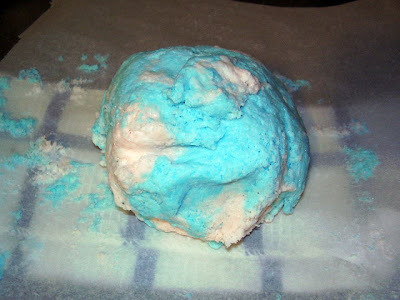 Tonight I am testing out a marshmellow bomb, I love marshmellow scents so I made a batch I knew I would love to try out. 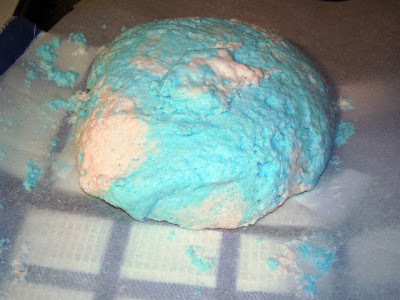 so what are some scents all of you like in bath bombs? here are some off the top of my head: black raspberry vanilla, lemon bundt cake, fuzzy navel, forbidden fruit, apple, sandalwood, pink sugar, love spell, orange, something with coconut and????? well round 3 of bath bombs was not good. I have a head cold so I think I will blame it on that! I tried to change the formula a tad and something must have went wrong. I started hearing the fizzing sound and things just weren't right. It started growing and won't stop growing. So I decided rather then toss it into the trash might as well use it in the tub. Sure was a nice silky bath and man has my skin been super soft testing out all these bath bombs. Picture one is after I mashed it down, the second picture is about 5 min later and let me tell you 5 minutes after that it was the size of my wrist to my elbow! 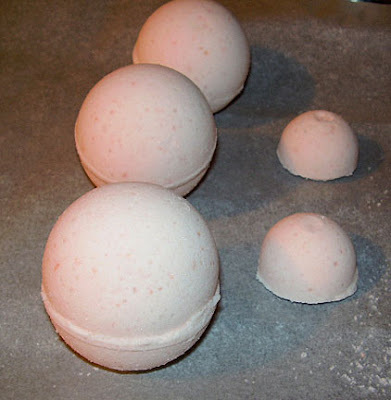 Here is round one of testing bath bombs, went ok so far the real test is how they dry over the next 24 hours. There is also the test in the tub, tough work testing out these new products right? These were Black Raspberry Vanilla with a touch of pink color. Stay tuned for the results. Once I get these mastered it will be time to move towards bath bomb cupcakes and soap cupcakes.